A native of Charlotte, NC (where his three beautiful daughters still reside), Barry moved to the Myrtle Beach area seven years ago, thanks in part to the greater opportunity the Grand Strand offered for two of his favorite pleasures: beach music and a good round of golf. He comes to us with decades of experience in outside sales, covering everything from residential renovations, to log homes, to funeral expenses. 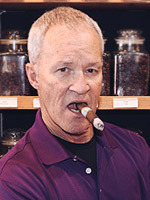 As our Retail Associate at Low Country Pipe and Cigar, Barry puts that experience to work assisting customers in choosing the right products and accessories for their own discerning tastes, building relationships with locals and tourists alike, as well as assisting Tim in the planning and organization of all of our many events. When he isn't otherwise busy taking care of our customers or working on his game, he also enjoys running, hitting the gym, home cooked meals, or simply relaxing with a cold beer and a quality maduro cigar.